Pardon me for a moment while I put on my old fogey hat (once again!). 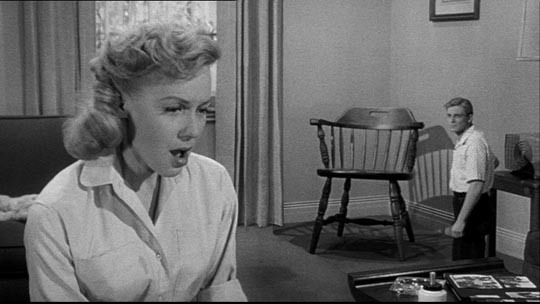 This past week, I saw two old ’50s movies – one, a prestige studio production screened digitally on a big multiplex screen; the other a modest studio B production shown from a 35mm print on the smaller Cinematheque screen. And they got me wondering why it is that, even in their black-and-white old age, they had a more powerful effect on me than most of what I see in contemporary film. Billy Wilder’s Sunset Blvd (1950) is, along with Ace In the Hole (1951), his finest, most accomplished work, a poisoned love letter to Hollywood and the corrupting influence of fame and glamour. 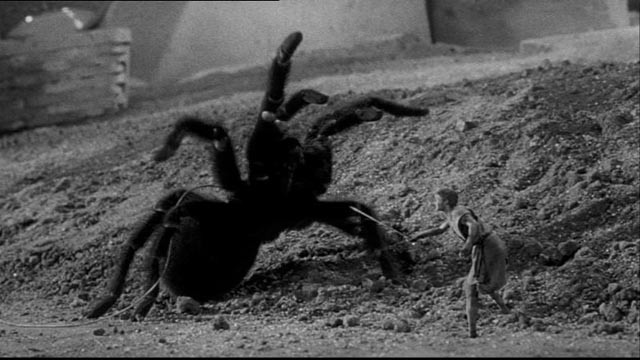 Jack Arnold’s The Incredible Shrinking Man (1957) is the most transcendent movie of the ’50s sci-fi cycle. And both are totally involving narratives in which the viewer becomes completely invested in the fates of their protagonists. 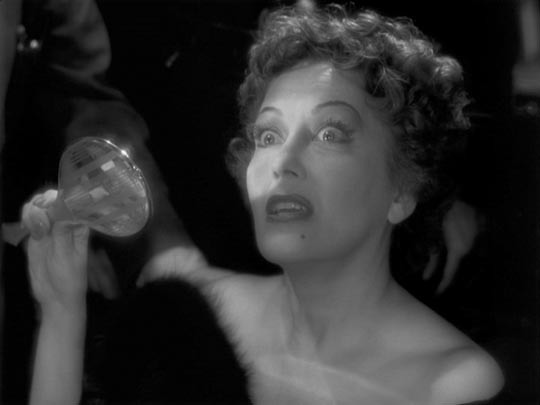 But while watching Wilder’s film, at a crucial point when the conflicted relationship between screenwriter Joe Gillis (William Holden) and faded silent star Norma Desmond (Gloria Swanson) is getting close to imploding, the camera frames the room with a doorway in the centre rear where Norma stands pleading and Joe walks into the foreground, facing us in huge close-up, his back to her, and I couldn’t help thinking: why is this close-up more powerful than a similar shot in … well, whatever recent movie you’d care to name? As I mulled this over, I came to the conclusion that it was because it emerged inexorably from the narrative context, building on a progression of moments which had led to just this moment in which Joe Gillis struggles to make some kind of moral choice, to come to terms with what he has sacrificed for the material comforts heaped on him by the deluded older woman. The emotional investment of a viewer in a film depends on engagement with the characters on screen, and the sense of presence, the “weight” of a character is rooted in the evocation of the space he or she inhabits, both physical and social. Joe Gillis is a bitter, washed up writer unable to get studio work; he has accepted Norma Desmond’s largesse because otherwise he’d be out on the street … but the situation has emasculated him and his comfort is compromised by humiliation and resentment. Now he’s reached a point where the humiliation is out-weighing the comfort and Wilder’s mise-en-scene is trapping him in the mansion’s stifling atmosphere of living death – this is the moment at which he walks close to the camera and we get to stare into his unguarded face in that looming close-up. Jack Arnold’s style is much less baroque than Wilder’s, and his telling of Scott Carey (Grant Williams)’s story is spare and efficient. Carey, contaminated by a combination of pesticides and radiation, begins to shrink. Initially, he tries to maintain some sense of middle-class normality, but his diminishing size has the same kind of impact on his sense of himself (his masculinity) as Joe Gillis’s becoming Norma Desmond’s boy-toy. He starts to take it out on his confused but loving wife, Louise (Randy Stuart). It’s only when he ends up, a few inches tall, trapped in the basement, presumed dead, that he can let go of his bruised ego; the most basic struggle for survival subsumes all other concerns. And it’s here that Arnold really shows his stuff, the second half of the movie becoming a visual tour-de-force as every familiar detail of the basement takes on monumental importance for Carey’s survival. Again, it’s the relationship between the character and the physical space he inhabits which defines and empowers the drama, and Arnold is very careful to establish that relationship so that we know at every moment where Carey is in relation to all the potential dangers surrounding him. It’s also worth mentioning that Arnold’s film, scripted by Richard Matheson from his own novel, is a fine example of what talented filmmakers could get away with in a big studio’s B unit, as long as they stayed on schedule and on budget and their work turned a profit. In effect, the film is a Buddhist fable in which an ego-centred man has all his material and social connections progressively stripped away until he finally comes to a pure, spiritual understanding of the meaning of existence. Not bad for a small movie about an irradiated guy who shrinks away to nothing! So why does it seem so rare that we experience that sense of drama today? In the simplest terms, it’s because modern filmmaking has largely become disconnected from character and story. In both Sunset Blvd and The Incredible Shrinking Man everything – design, camerawork, cutting, performance – is in service of character and story, every detail is anchored. 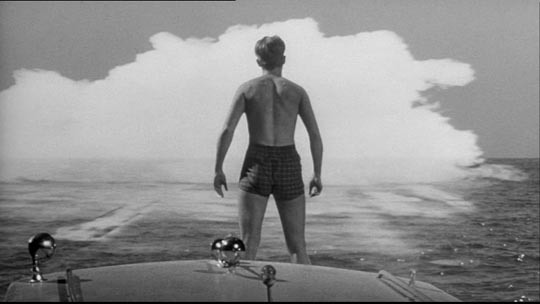 But the style that has evolved in mainstream filmmaking over the past few decades (heavily influenced by commercials and music videos, arenas from which many of today’s directors emerged) is one in which every element is free-floating as part of a compulsion to provide visual distraction, to give the impression that at every moment “something is happening” when in fact nothing much is going on and nobody is really going anywhere. In those older films, there’s a balance between stillness and motion, each supporting and giving context and meaning to the other … but in modern films stillness has been banished because if the movement ever paused the audience would quickly realize that they really aren’t engaged at all, merely distracted. I’m reminded of Pauline Kael’s criticism of Richard Lester’s A Funny Thing Happened On the Way To the Forum (1966) – that the director’s imposition of technique, his fragmentation of the action through rapid cutting and multiple camera angles, rendered the dance numbers incoherent and meaningless, the performers’ bodies being diced up into so many unrelated pieces. The visual frenzy of modern editing has done something similar to performance, cutting actors into so many tiny pieces that they become weightless. 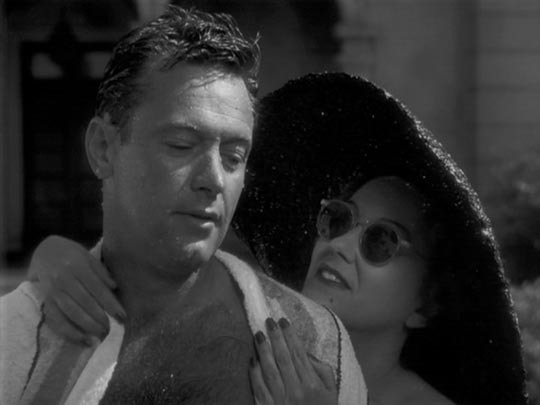 That’s why I was so amazed by the overwhelming sense of presence William Holden has in Sunset Blvd (and Anthony Perkins had in Psycho, when I saw it again on a big screen two years ago) … A steady diet of big, empty spectacles had made me forget what a sense of cinematic reality could feel like. Paradoxically, the triumph of digital theatre projection may help to revive this kind of awareness as it’s now economically viable for the big multiplex chains to (however parsimoniously) devote just a little bit of screen time to exhibiting these fragments of film history. By a strange coincidence, just as I was formulating these thoughts a friend pointed out a lengthy article by David Denby, published in the September 14 New Republic, called “Has Hollywood Murdered the Movies?” He makes much the same argument, but in far greater depth and far more eloquently than I can. This entry was posted in Commentary, Review and tagged Actors, Digital Cinema, Directors, Hollywood, Science Fiction. Bookmark the permalink.